Multiple Grade 1-winning millionaire Accelerate, a leading contender for this year’s Breeders’ Cup Classic, will stand at Lane’s End Farm upon retirement, it was announced Wednesday. 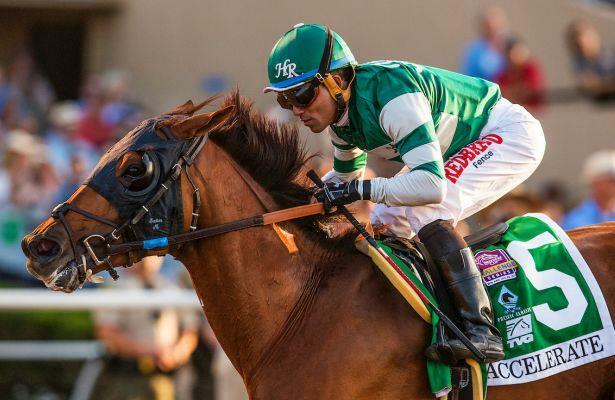 This year, Accelerate became just the third horse to sweep each of the Santa Anita Handicap, Gold Cup and Pacific Classic, which he won last out by a record 12 1/2 lengths. Accelerate ranks No. 1 in the current NTRA Top Thoroughbred Poll ahead of the Triple Crown winner, Justify. Accelerate is from a sire line very familiar with Lane’s End, having stood Champion Sire Smart Strike. Accelerate is by Champion Lookin At Lucky and is out of the stakes-placed dam Issues. He is a half-brother to stakes winners Daddy DT and Amarish. He is inbred to Broodmare of the Year Smartaire, which is the family of Champion 2-year-old filly Smart Angle and successful sire Smarten, who is most notable as the broodmare sire of Smart Strike. Accelerate sports a lifetime record of 20-8-5-5 with $2,312,480 in earnings.